Has Apple cracked the connected-home conundrum? Not if these two products are any indication. If you thought Apple would swoop in with its HomeKit platform and solve all the ills that bedevil the fledgling smart-home market, that it would show the rest of the industry just how simple it can be to enable consumers to build out a smart home, your faith has yet to be rewarded. Judging by the first two HomeKit hubs to reach the market—Lutron’s Caseta Wireless Smart Bridge Pro and Insteon’s Insteon Hub Pro—Apple is having as much difficulty taming the installation beast as any other manufacturer that’s made the attempt. Putting a smart home together is a lot of work. I know, because I built one from scratch seven years ago. I’ve tweaked and modified and upgraded numerous times since then and it’s still not perfect. Some changes were difficult to implement, and an upgrade to one subsystem sometimes breaks another. The connected home is coming closer to being mainstream every day, but it’s not there, yet. I’m sure Apple’s presence in this space will help—competition always does—but don’t buy into HomeKit thinking the folks in Cupertino have broken the code. 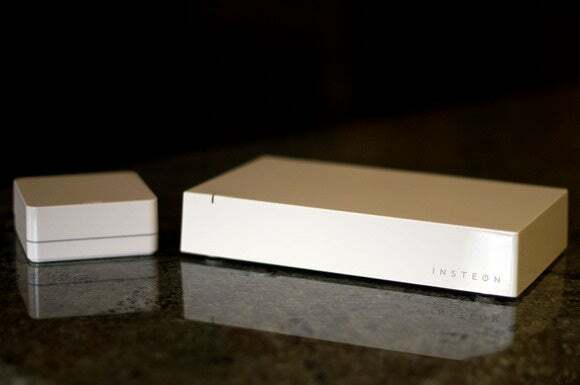 Insteon has been in the connected-home space since the Jurassic period (I’m kidding of course, but Insteon emerged from a home-automation catalog company that was started in 1992). Lutron is an even older company, having been founded in the late 1950s. 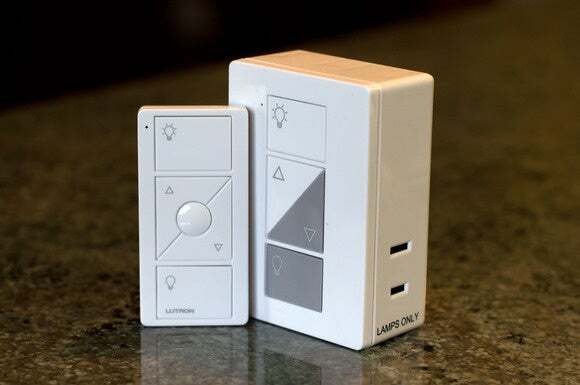 Its founder invented the dimmer, and the company introduced a wireless whole-home lighting control system in 1997, but it’s a relative newcomer to the connected-home space—at least at the DIY level. If you're not comfortable dealing with electrical wiring, both companies offer simple plug-in modules. Lutron's comes with a remote control. Both companies’ HomeKit systems are modified versions of existing connected-home hubs, and both are compatible with HomeKit products as well as each company’s respective legacy products (to an extent, at least; more on that later). Those legacy products, by the way, are not HomeKit devices, which means you can’t control Lutron lighting or window-shade controls with Insteon’s hub, and you can’t control any of Insteon’s devices with the Lutron Caseta bridge. As with any other HomeKit device, you’ll need an Apple TV (third generation or newer) to control either system from outside your home. In my view, lighting control and physical security are the most desirable elements of a connected home. These kits deliver only part of the former and none of the latter. Both company’s lighting controls are pretty good—you can control individual lights or groups of lights with your iPhone or iPad, and you can schedule lights to turn on and off at designated times—but neither hub supports door/window or motion sensors, so you can’t program lights to turn on in response to events: When a door opens, for instance, or when motion is detected. On the security front, neither Insteon’s hub or Lutron’s bridge supports smart door locks, security cameras, smoke detectors, or as I’ve already mentioned, open/closed or motion sensors. Insteon has a far more complete collection of connected-home devices than Lutron does, including leak sensors, door-lock controllers, infrared transmitters and receivers, and much more; but the Insteon Hub Pro is not currently compatible with many of them (you'll find a complete list here). It does support Insteon-brand dimmable LED bulbs (both A19 and PAR38, for recessed lighting), dimmer outlets, and on/off modules (for controlling devices such as box or oscillating fans or non-dimmable light bulbs). 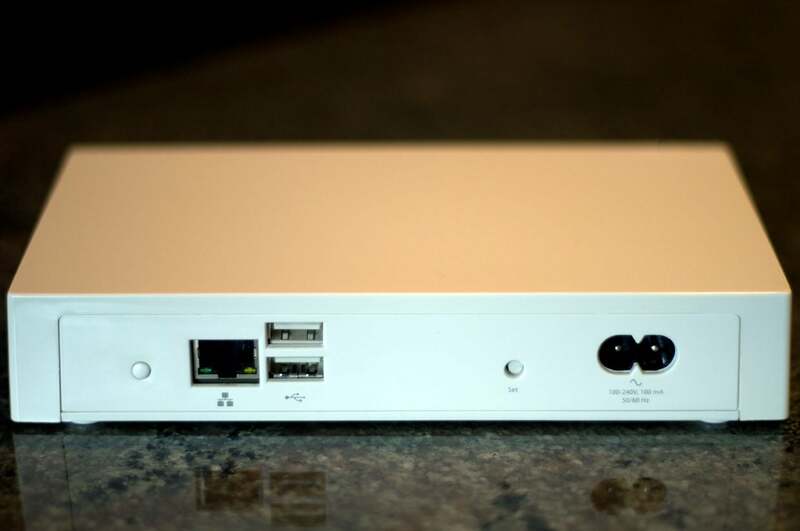 Insteon's larger hub has an integrated power supply, so you don't need a wall wart. But since it uses both powerline and RF networking, you can't plug it into a surge protector. Lutron’s Caseta bridge, on the other hand, offers several features that Insteon’s hub does not: Support for a limited number of smart thermostats (Honeywell’s Wi-Fi thermostat and the Nest Learning Thermostat), support for motorized window shades (Lutron models), and support for geofencing (so you can program lights to turn on when you approach your home with your smartphone, and turn off when you leave with it). Using Siri to control your connected home is the same process for both HomeKit controllers. 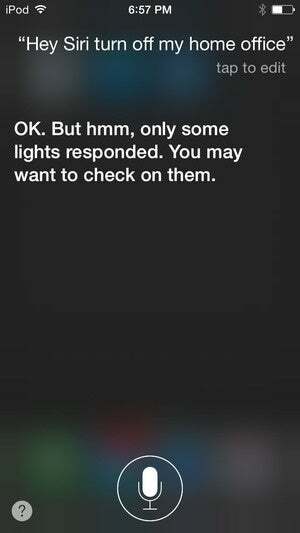 You can utter Siri commands to control individual devices (“Hey Siri, turn on the bedroom lamp”); to control Rooms, or groups of devices (“Hey Siri, turn on the home theater”); to control Zones, or groups of Rooms (“Hey Siri, turn off the downstairs”); and to control Scenes, which can be devices in the same room or in different rooms (“Hey Siri, set the scene to Movie Time”). I’m not a long-time Siri user, so I’ll chalk up some of my early problems using voice recognition to inexperience or not speaking clearly enough for it to understand what I said. But there were also many situations where the text my iPod touch display matched exactly what I said, and Siri reported that my instruction had been performed, but nothing actually happened. After reviewing the Roku 3 media streamer, I concluded that voice commands are better and more efficient than using the any point-and-click or touchscreen user interface—when they work. When voice commands don’t work, you get even more frustrated because you look like an idiot talking to an inanimate object. I found that Siri’s performance improved over time, but at this point, no one should buy a HomeKit-based connected-home system because it supports voice recognition. Which is the better HomeKit hub? Beyond what I’ve said about Siri, I won’t render a judgment on HomeKit itself here; that wouldn’t be fair based on the performance of just two devices that are iterations of existing products with HomeKit support tacked on (the addition is more than just a simple firmware change. You can’t upgrade either company’s older controller to render it HomeKit compatible). But I do think it’s lame that the only way to control HomeKit devices from outside your home is to have an Apple TV on your home network. (This requirement is supposed to go away with the release of iOS 9). But if you want a HomeKit controller today, Lutron has the slightly better product. Both its hardware and software are more polished than Insteon’s offering, and support for programmable thermostats and geofencing is more valuable than being able to control dimmer outlets, on/off modules, and dimmable smart bulbs (that is, bulbs that don’t require smart plug-in or in-wall switches). Plus, Lutron’s bridge can be controlled by both iOS and Android devices (although voice commands are not supported on the latter platform). For all the details of how I reached my conclusion, please read the individual reviews that follow (click the Next Article button, below).